The long weekend is upon us, and like most Filipinos, I am headed out of Manila. As much as I prefer to avoid traveling on a peak weekend, this is my last chance to hit the beach as summer ends. Inside Viktor: clothes, battery charger, SD card reader, sunblock, googles, toiletries, underwater case, medicine kit, hat, Envirosax bags. I’ve been looking forward to this trip for weeks. The weather’s looking great, and I’m excited to try out my new underwater camera case. 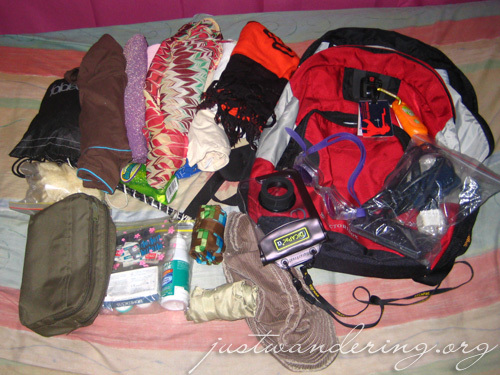 In my messenger bag: book, kikay kit, wallet, Pinkies and bobble head (new travel gnome! ), MP3 player, MRT cards. Where am I going? All I’m saying it’s one of the places in my poll How about you, where are YOU going this weekend? Hi, Nina! How’s the DiCapac underwater camera case? I asked jtworld about it. They said WP300 is no longer available. So I just settled for a different camera case. Then a day before I hit out of town, they emailed to tell me WP310 is available. The latest version of WP300… I hope you can make a feedback about your camera case. Hhhhmmm… I went to one of the places in your poll, too. Hey An! The Dicapac worked spendidly! I’ll be posting some of the underwater pics sometime this week, so you can see how it works with the camera. i saw that you had a great time in coron! super complete ung stuff mo!! long weekend ko..nope..stayed home with family lang. been spending as much time as possible with family. im moving na kasi. have a good week ahead, nina! Hi Lizeth! Yup, our Coron weekend was really fun. I’m actually looking forward to having a weekend at home. Good luck on your move! I’m going to palawan on the 17th and i want to buy a dicapac for my digicam and my mobile phone. I would like to know how much the dicapac is and where did you buy it.